Painted cabinets, with new hinges and handles. One of the least attractive aspects to the condo we're rehabbing was the look of the kitchen. 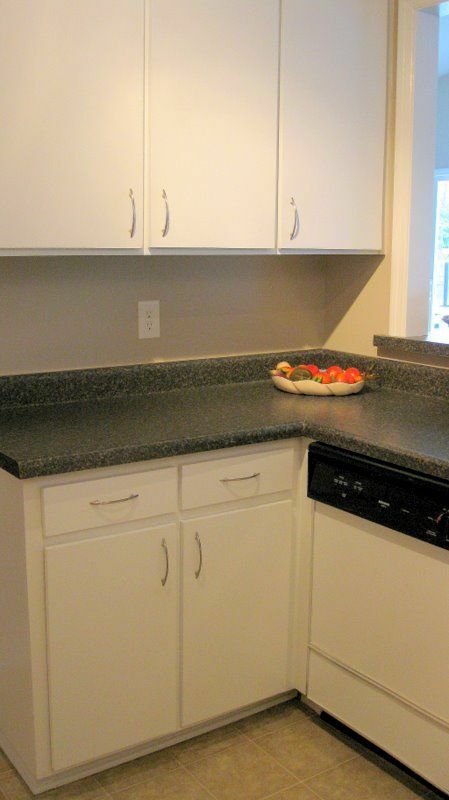 We knew that kitchens are important to buyers, and we knew this kitchen wasn't getting a passing grade. While there was nothing inherently wrong with the layout, it looked like a somewhat controlled explosion of cabinet doors, knobs, and hinges. It was Mr. Carpenter who came up with the idea of replacing a vertical stack of three small cabinet doors with one long door, and hanging them with concealed hinges. The look will be clean and streamlined, an upgrade for sure. He’s taken measurements and will be working on those top-grade plywood doors back at his shop. Update: The photo aove shows what the cabinets looked like when we finished with the makeover. With doors off the kitchen cabinets, I’m able to go to work on the insides. They were nasty with a capital N. It always blows me away to see how some people put a home on the market. 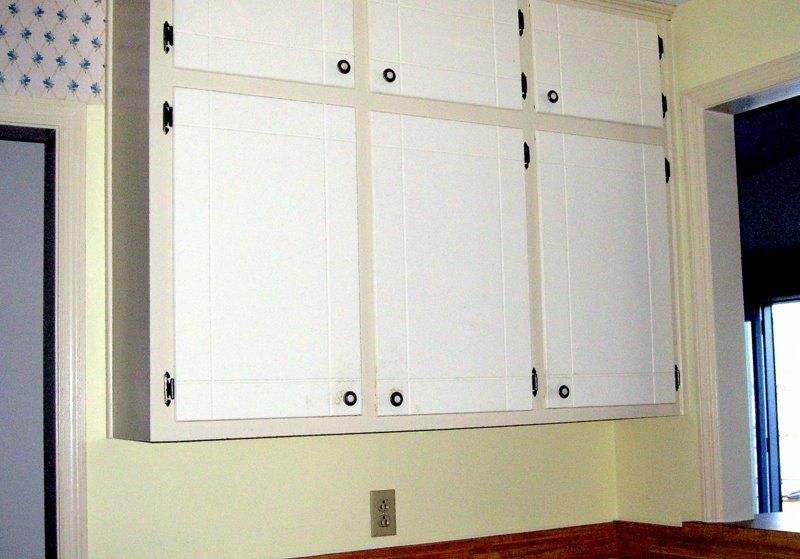 Would it have killed these sellers to take 15 minutes to spray and wipe inside the cabinets? Or paid someone to do it? 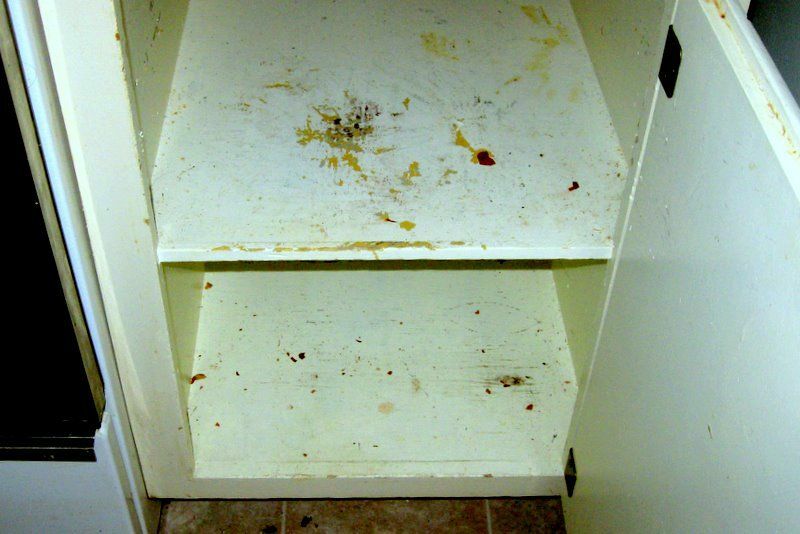 I suspect that dirty cabinet interiors are just one more reason this property sat on the market for two years. Disgusting details like that are the subtle turn-offs for people out househunting. Buyers subconsciously assume other problems lurk unseen. Meanwhile, Mr. Lucky has removed all wooden shelving from all closets, so that I can fly in on those. I’m sanding them, then giving them all two coats of bright white semi gloss paint. I want those closets to glow! I taped contractor’s paper to the floor of every closet, and Mr. Lucky came behind me with the airless paint sprayer and gave every closet a fresh coat of paint from top to bottom. We always like to do closets with white semi gloss paint. The semi gloss is easier to wipe clean, and the white reflects light better. Also, should a homeowner later decide to change the wall color of a room, the white closet doesn’t have to be painted to match, which isn’t the case when a closet in a pink room gets painted pink to match the room. These are the same cabinets pictured above, before we painted them. The dark hinges and knobs were distracting and dated. If you are dressing up a home for market, consider painting your closets after you have decluttered them. It’s not necessary to have a paint sprayer, just faster. If your closets have wooden shelves, either paint them in place, or remove and paint both sides. If you have vinyl shelving, just paint around the supports and shelves. My advice? Do a closet each day to make it painless. If they are small enough, you can brush them and save roller cleanup time. Painting the ceilings will make the closet look bigger and brighter, but painting their popcorn ceilings is messy. To learn other staging and kitchen makeover tips, check out my eBook, DIY Home Staging Tips to Sell Your Home Fast and For Top Dollar. Are You a Granite Snob? Paper on Walls, Popcorn on Ceilings, Ugh! Where Does Furniture for Staging Come From?